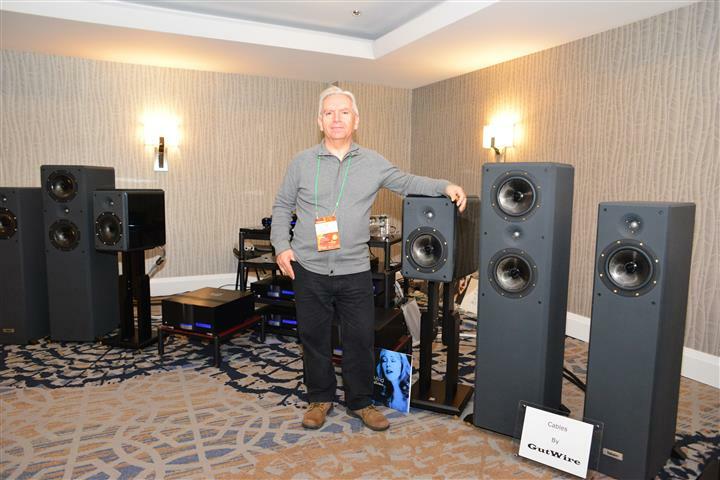 Editor’s note: Last week, we posted TAVES 2016 show coverage PART 1 and PART 2 from George de Sa. 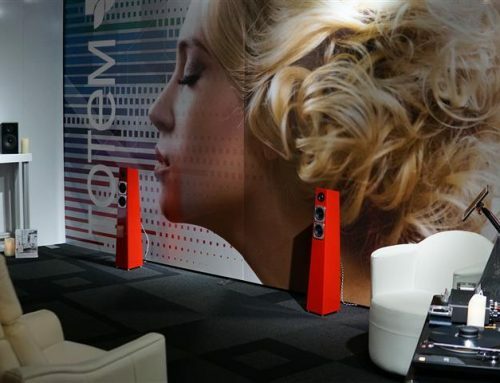 Today we invite you to read about some of the high-end hifi exhibitors explored in detail on the show floor by NOVO magazine’s Douglas Brown. CH Precision is an ultra high-end audio company that’s based out of Lausanne Switzerland (CH). While a number of different exhibitors at TAVES 2016 used CH’s components, only Audio by Mark Jones had a design engineer from CH Precision on hand to answer technical questions about their gear. Raphael Pasche travelled all the way from Switzerland and was generous enough to sit down with me for about 20 minutes to chat about CH’s gear at this year’s TAVES. 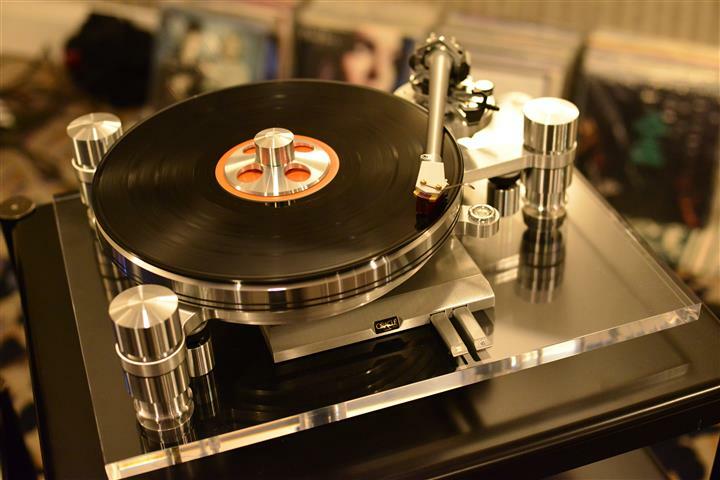 In a breathtaking 2-channel system, Mark Jones used a Kronos Pro turntable ($38,000 USD), with a matching Kronos Black Beauty tonearm ($8,500 USD), and an Ortofon A95 M/C cartridge ($7,000 USD) as their vinyl source. 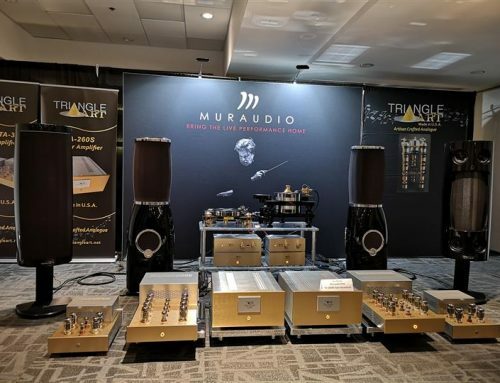 Along with a CH Precision solid state P1 phono stage ($31,000 USD), a CH L1 dual mon-aural pre-amplifier ($35,000 USD), CH’s pair of M1 mono-block amplifiers ($95,000 USD), a pair of Nordost Valhalla 2 interconnects ($9,000 USD), and an 8 foot pair of Valhalla 2 speaker cables ($16,000 USD), these components drove a pair of Magico S5 Mk#2 full-range loudspeakers (pair in use came with the upgraded M-Coat finish $42,000 USD). Across the entire frequency spectrum, the sound of this system was as cohesive and 3-dimensional as any that I heard during the entire weekend. CH Precision also brought their D1 SACD / CD drive ($38,000 USD) and their C1 DAC ($33,000 USD) as a 2-channel digital reference system. All of CH Precision’s components are based on modular designs and can be “tailor made” to the needs and demands of any 2-channel system. The C1 DAC, for example, can have an asynchronous USB-input board ($3,000 USD) and/or an Ethernet streaming board ($5,000 USD) installed for use with digital streams and/or Ethernet-based sources. 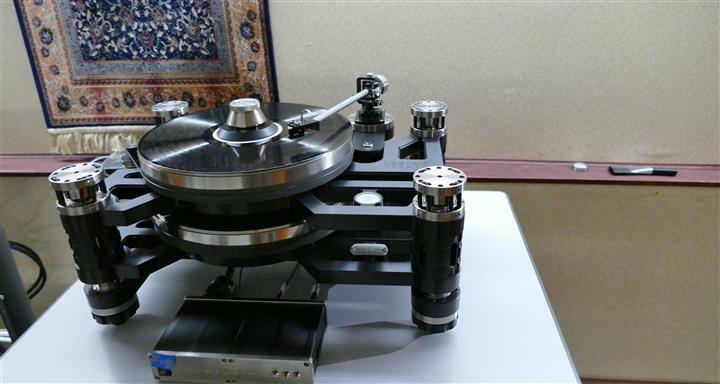 DVL Audio’s ultra high-end 2-channel system featured a Kronos turntable ($36,000 USD), a matching Kronos Black Beauty tonearm ($8,500 USD), and a Haniwa low inductance M/C cartridge ($8,000 USD). DVL also brought Swiss CH Precision’s D1 SACD / CD transport + player ($38,000 USD) and a CH Precision C1 Reference DAC ($33,000 USD) as their digital source. For its Canadian premiere, DVL debuted CH Precision’s P1 dual mono phono pre-amplifier ($31,250 USD) and X1 external power supply ($15,000 USD). 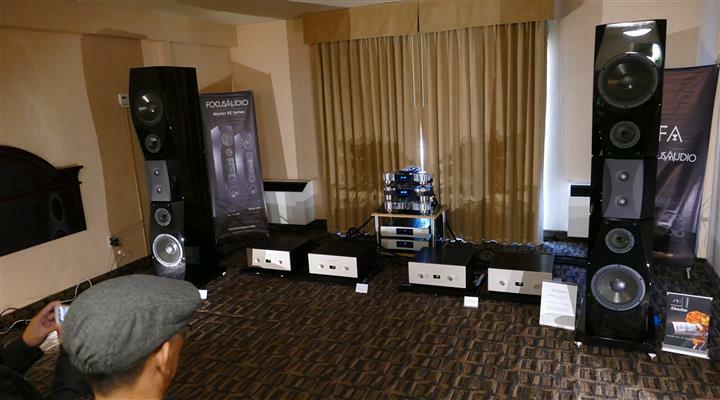 A Viola Labs Bravo 2-channel stereo power amplifier ($59,000 USD) rounded out their components. The gorgeous equipment racks were from Spanish Artesania Audio (prices range from $2,600 USD to $3,690 USD). They used a full loom of CH Precision’s own in-house brand cables. DVL showcased a floorstanding pair of Magico S7 full-range 3-way loudspeakers in a stunning ‘Lamborghini Orange’ [my words… not theirs] colour ($64,000 USD). When I first walked into DVL Audio’s room and spotted the Kronos ‘table, I assumed (incorrectly) that they’d chosen vinyl as their source. I was wrong. This was the only room at the entire TAVES 2016 extravaganza where I mistook a digital source for an analog one. So… kudos to DVL for getting such a warm and natural sound out of their digital gear. 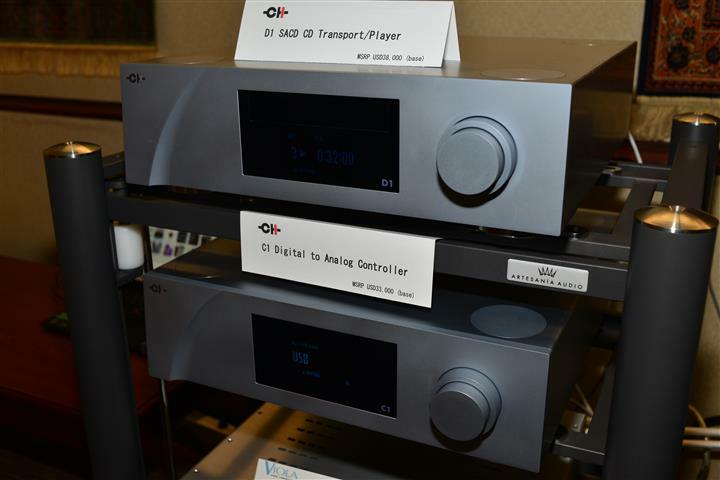 With a history of releasing ‘cutting edge’ digital products, EXA Sound of Toronto gave TAVES 2016 the world premier of two new DACs: 1), their brand new flagship e32 two-channel DAC ($3,499 USD); and 2), their new e38 multi-channel DAC ($3,849 USD). Both DACs are based on the 4th-generation Sabre ES-9028 digital chip. All of EXA Sound’s components are designed and built entirely in Canada. 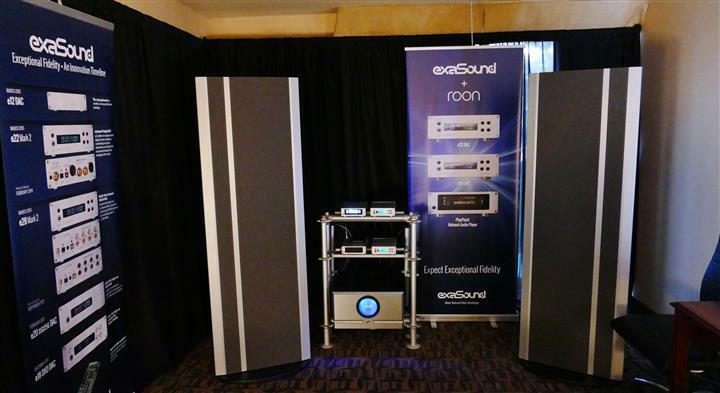 Set-up in a 2-channel system with EXA Sound’s PlayPoint Network Audio Player ($1,999 USD), the e32 DAC, a Pass Labs X350.8 solid state power amplifier ($19,900 CDN), and a pair of Magnepan 3.7i loudspeakers ($5,995 USD / pair), the sound was clean, dynamic, and, to my ears, decidedly non-digital. Focus Audio has been based locally out of Markham Ontario for 20+ years. 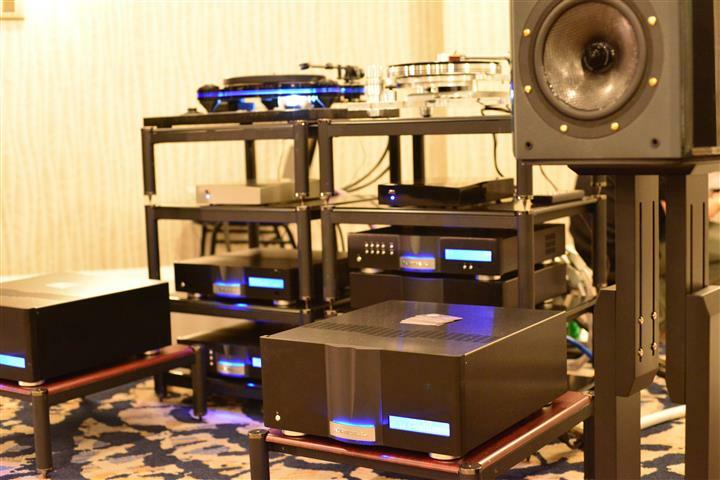 Focus brought a Metronome Technologie Kalista Signature CD transport + DAC ($85,000 USD) as their digital source in a 2-channel system which proudly showcased their Liszt Concert integrated mono amplifier ($25,000 USD). Combined with a full loom of French Absolue Créations cables (approx. value $10,000 USD), Focus Audio’s massive 6 foot tall Master Two BE speakers ($45,000 USD) that weigh-in at 220 Lbs each(!) provided a HUGE soundstage with an equally impressive placement of individual instruments within a 3-dimensional sphere of sound. 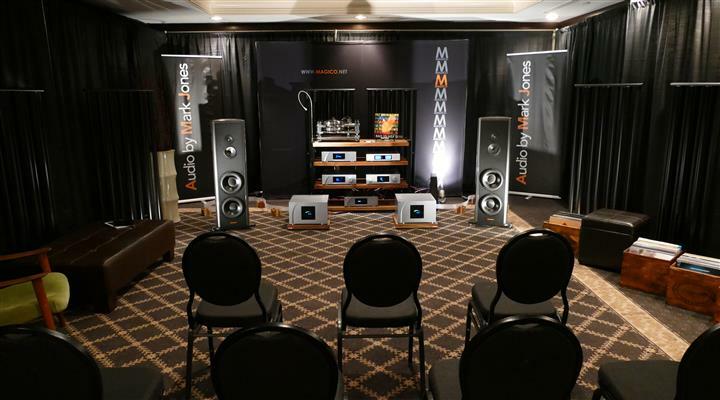 In my notes, I wrote: “Fast transients, ultra-clean detail, with superb PRaT, massive soundstaging, and impressive dynamics.” The Focus Audio room easily made my list of ‘Top 5’ two-channel systems at this year’s TAVES. Providing custom acoustical measurement services to both the pro-audio and consumer electronics markets, Gerr Audio of Toronto promoted their Smaart V8 software packages to bench techs, professional audio engineers, and audiophiles alike. The V8 version of their Smaart (System Measurement Acoustic Analysis Real-time Tool) offers multi-channel real-time measurement for both Windows and Mac O/S operating systems (both 32-bit and 64-bit versions). Priced at $1,900 CDN for the full software, microphone, and interface kit, Smaart V8 can run multiple / simultaneous spectrum and transfer function measurements. Also carrying a full line of Audio Precision’s APx Series audio analyzers, APx digital I/O interface options, and Classic Series audio analyzers, Gerr Audio is the one-stop shop for professional audio engineers and home audio enthusiasts alike in the broadcast, communications, bench-tech, and production environments. The thinner outer-casing has decreased the HE-1000 V2’s weight from 480 grams (16.9 ounces) in the V1 version, down to 420 grams (14.8 ounces) in the V2. The CNC-machined fit and finish of the HE-1000 V2s truly places them in the “reference calibre” category. After a good listen, I concluded that these are one of the best sounding headphones which currently exist on this or any other planet. I also auditioned several of HiFi Man’s more reasonably priced headphone models which start around the $300 CDN level. All of them produced impressive sonics with a smooth and musical sound. With a high sensitivity of 103dB, HiFi Man’s Edition-X v2 headphones were designed to be used with smart-phones, portable Digital Media Players, and high-end portable audio devices. Listening to Hi-Rez digital files from an Astell & Kern AK240, the sound quality of the Edition-X v2 open back planar-ribbon headphones ($1,799 CDN) was stunning. If you’re an audiophile who uses portable devices a lot, do yourself a favour and audition a pair of HiFi Man headphones. For TAVES 2016, local Markham Ontario based purveyors of high-end audio/video systems Kennedy Hifi had a multi-channel home theatre set-up. Using a BlueSound Vault-Two 2TB hard-drive + CD-Ripper ($1,400 CDN) as a source, Kennedy brought Toronto the Canadian premiere of Paradigm’s new Anthem 2-channel S.T.R. solid state integrated amplifier + DAC ($4,995 CDN). Providing a healthy 2 x 225 watts into 8 Ohms, the clean, detailed, and surprisingly warm sound of this solid state integrated amp was a pleasure to listen to. They used AudioQuest cables throughout their multi-channel system. Driving Paradigm’s just-introduced, reference Persona 9H hybrid loudspeakers ($38,000 CDN), the synergy between the S.T.R. amplifier and the Persona 9H speakers brought a tactile realism to movie soundtracks that was simply remarkable to hear; and feel. The Krell / Oracle / Reference 3A / Gutwire room was a tale of four superb ultra high-end 2-channel audio companies combining their individual areas of expertise to bring a sonic synergy that was a pleasure to hear. 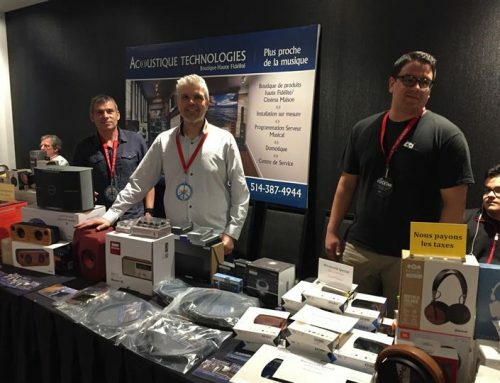 Jacques Riendeau and Stephane Maddau own Oracle Audio. Oracle has their own machine shop in Sherbrooke Quebec and every one of their exquisite turntables and phono stages is designed and built entirely in Canada. 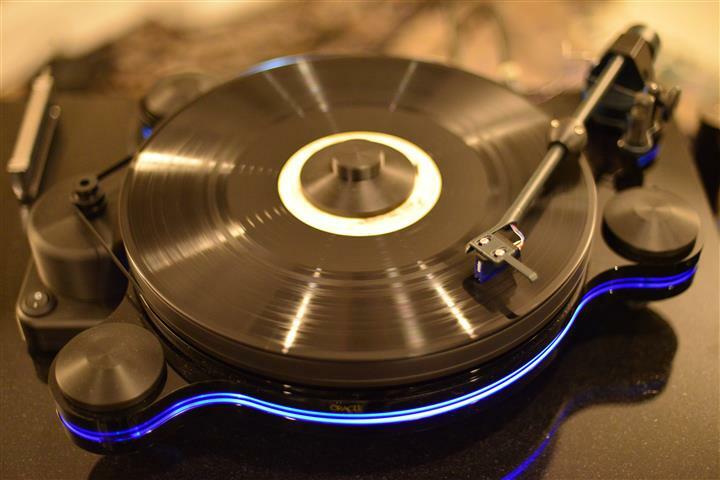 For TAVES 2016, Oracle brought their flagship Delphi Mk#6 – 2nd generation turntable ($9,000 CDN) that was outfitted with an SME-345 tonearm ($3,750 CDN) and a Cardas wiring harness. Monsieur Riendeau was particularly excited to tell me about Oracle’s new “entry level” Origine turntable, which comes equipped with a uni-pivot arm for the modest asking price of $2,000 CDN. Oracle also debuted their PH-100 ($900 CDN) and PH-200 ($1,800 CDN) solid state phono stages to the Canadian market. Since TAVES started in 2011 six shows ago, this was Krell’s first visit to Toronto. Rondi D’Agostino (yes… that D’Agostino) bought Krell back and, as their current Managing Director, it’s clear that Krell’s commitment to ultra high-end 2-channel sound is stronger than ever. Designed and built entirely in the USA, Krell proudly showcased their new solid state Illusion pre-amp ($20,300 CDN) and Solo 575 mono block amplifiers ($30,800 CDN per pair). 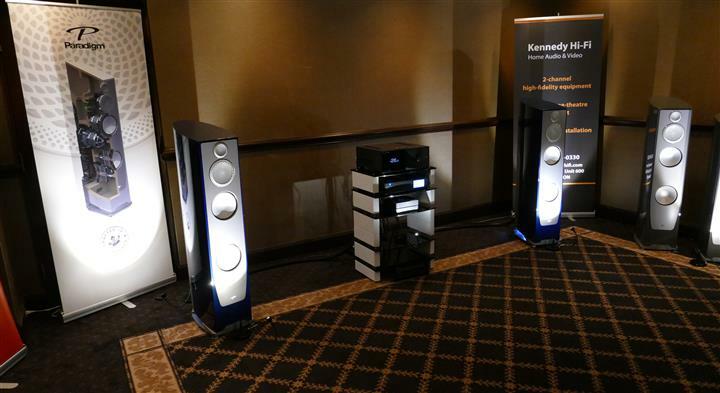 Krell also brought their Vanguard DAC ($8,300 CDN) and Digital Vanguard Streamer ($6,800 CDN) to Toronto. Venerable owner Tosh Goka of Reference 3A took the time to explain, at length, all of the advanced engineering work—in fact… two full years of research and design work—that went into Reference 3A’s new Reflector stand-mount monitors ($12,000 USD / pair). Featuring adjustable tension rods to control the Reflector’s internal anti-vibration bracing and constrained layers fabricated out of real glass which have been laminated to the top and sides of the speakers over High Density Fibre-board (HDF), to my ears, the Reflector was the best sounding bookshelf / stand-mount monitor at this year’s TAVES. 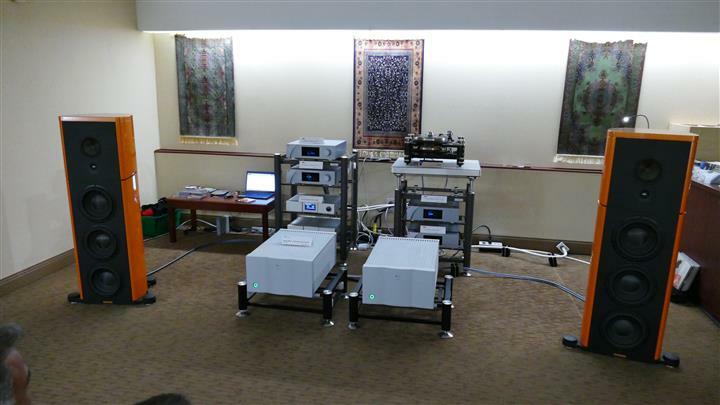 It was a privilege to see (and hear) Krell partnered-up with Oracle and Reference 3A. From my notes, the sound I experienced in their room was utterly mesmerizing. The smooth, organic, and captivating quality of Oracle’s vinyl rig mated particularly well with the rich, deep, and powerful sound of Krell’s solid state pre/power components. Reference 3A’s new Reflector monitors allowed me to hear all of the subtle micro & macro sonic details, harmonic richness, and hip-swinging PRaT that this system produced. A full loom of cabling was supplied by Gutwire. 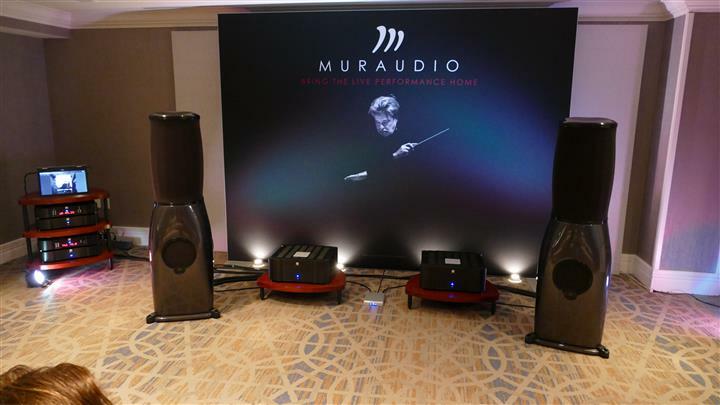 Based out of Ottawa Ontario, Muraudio brought their flagship Domain Omni PX-2 electrostatic floorstanding speakers ($79,500 USD) which feature a “…360 degree array of continuous curve ESL panels” to Toronto. These amazing speakers offer listeners all of the sonic benefits of lightning-fast transients and the breathtaking PRaT which traditional ESL panel speakers do, but with a vastly increased “sweet spot”. Combined in a 2-channel system with Sim Audio’s Moon 750 CD / DAC transport ($14,000 USD), Moon 820S A/C power supply ($8,000 USD), Moon 850P stereo pre-amp ($30,000 USD), and Moon 870 mono-block amplifiers ($44,000 USD for a pair of amps), and a full loom of Shunyata’s eTron cables ($21,000 USD), the Muraudio room had an amazingly full, warm, and cohesive sound. Given my 35+ year long love affair with Quad ESL-57s and ESL-63s electrostatic loudspeakers, it was a delight to hear a new take on electro-static panel speakers.